CPSIA - Why Hasn't Data Changed Opinions at the CPSC? I have recently published numerous blogs on CPSC recall data documenting the dearth of injuries and deaths from lead in the past decade. I am certainly not indifferent to the suffering of any victim, however, I note that data on injuries is a way to measure the urgency of the threat. There has been one death and three asserted injuries in the last eleven years from lead. We are a country of 300 million-plus and have a $15 trillion dollar economy - presumably, we need to prioritize. I have also provided CPSC data on injuries and deaths from other hazards, such as cadmium (zero), pool drains (very low, but greater than lead), phthalates (zero) and pool and spa (extremely high, more in an average day than in a decade for lead, phthalates and cadmium put together). In fact, I documented the distribution of injuries and deaths among all recalled children's products over an 11-year period. At one death and three unverified injuries, lead comes in last among all recall categories with more than eight recalls over 11 years (lead and lead-in-paint accounted for 248 of 899 total recalls in the surveyed period of time). Literally every significant hazard facing children in consumer products is worse and much more dangerous than lead according to the CPSC's own data. I have also shown that the data on recalls publicized by the CPSC tends to magnify the scale of lead recalls, making the recalls seem more threatening and the implied hazard more urgent than they really are. Among other things, the quantity of recalled products typically (if not always) includes inventory in the possession of the manufacturer. This inventory NEVER MADE IT TO THE MARKET. In addition, recall data also includes product still on the shelf at retailers. This inventory, which was sold by the manufacturer to the retailer, was never sold to consumers. Inventory in the possession of the manufacturer, its factories or its retailers has no conceivable potential to harm a child. The amount of product in the hands of consumers could be tiny. Please consider these facts when evaluating the claims of consumer groups on the "poor" effectiveness of recalls. The math gets all tangled up, doesn't it? And yet the CPSC seems to have no interest in this data, their OWN data. Why? Well, the best I can say is that they believe every life is precious and thus, economics cannot be considered when designing a response to the hazard. I did not invent this view of the consumer group-dominated Commission - I asked this very question of a person in a position to know, and got this answer. So there you go. Does this hold water, that economics are irrelevant and should never be considered? First, on the relevance of economics, I think that's a silly proposition. Of course economics matters. Please don't feign shock or disgust. Let's do an exercise: How much shall we spend to save a life? A child died from swallowing a lead charm on a single bracelet several years ago. This is the lone reported death from lead or lead-in-paint from a consumer product in at least 11 years and has been cited as a justification for the CPSIA maelstrom. In this space, I have adopted a proxy estimate of $5.6 billion in annual CPSIA compliance costs for the children's product industry (based on a submission of the HTA to support their Congressional testimony). So, is $5.6 billion the "right" amount to spend annually to prevent the next loss of life? Sure, you say, spend the $5.6 billion each year, every life is precious. Okay, does the cumulative spend of $61.9 billion over 11 years (to match the period in which the one death occurred) sound a bit extreme? Can you think of anything else that might be a better use of $61.9 billion? [Like a new national highway system? A new electrical grid? A few more cruise missiles? A few months of national health care?] I would note that $62 billion is double the provisional losses of BP from the Gulf oil spill. That's a lot of coconuts, if you ask me. Should we spend $61.9 billion on every cause of death? What about causes of death that are "worse", meaning that loss of life is greater? Should we spend proportionately? If our resources are limited (I used to think that was relevant but lately, who knows? ), how should we allocate our limited dollars? Is it okay to prioritize? Does lead make the cut if we try to allocate rationally? The benefits of the regulation are calculated by assessing the economic value of lives and injuries. To regulate otherwise is economically irrational - which is where the CPSC seems to be. More to the point, economic irrationality is against the weight of U.S. jurisprudence, not to mention laws limiting the ability of the government to issue regulations. Hate to sound trendy, but it is Big Government completely out of control to contend that lives are "priceless" and to assert that the cost to avoid injury or death should not be limited by economic considerations. Please note that the EPA assesses the economic "value" of a life at $6.1 million. For even more perspective, the EPA says that one IQ point lost to lead is worth $8,346. CPSIA compliance costs are not less than $5.6 billion EACH YEAR. Do the math. Okay, this is bordering on insulting your intelligence. Yet, astoundingly, the CPSC doesn't get it. What about the behavior of the CPSC itself - do they ever consider economics? Again, at the risk of insulting your intelligence, of course they do. For one thing, they themselves have limited resources. They can't do everything they want, and have to make choices. They have a BUDGET. They can't hire everyone they want, can't inspect everything, can't process every claim immediately and so on. They also make practical judgments on some things. I reported recently the tarring the Commission received for making a practical judgment about how to implement the pool drain law. In that case, they chose to agree with the recommendations of industry, which is heresy in some circles . Certain members of Congress live in those circles . . . . No doubt the savaging of the Commission over that minor practical judgment will have the intended effect of eliminating whatever shreds of common sense or backbone extant at the CPSC and the Commission. Perhaps this is the end of their consideration of economics . . . .
Where does this leave us? Come on, guys, right where we were for the last two years! We continue to rail against this awful law, and the CPSC gets progressively more and more stone deaf. I feel increasingly like I am mumbling to myself, especially when they won't respond to their own data or other data-driven rational arguments. Given that the Dems have made their name by being totally deaf to the legitimate concerns of industry, what choices are left to us? I am turning more of my energies to the 2010 Midterm elections. I hope you will also do what you can to change the dynamic in Washington. You've seen what these people have done in the last 18 months. Ready for more? I'm not. And I am doing something about it. I am back in the saddle and wanted to thank our Guest Bloggers for their contributions in my absence. Likewise, I really appreciate the support and creativity of the staff of the Alliance for Children's Product Safety in their administration of the blog while I was gone. I find that the passage of time has not brought us any relief. With the newly asserted need to test carpets for lead and recalls of lacrosse gloves for lead-in-ink, the goofiness that had us in its grip when I left still has us in its grip today. I will comment on these and other matters in the coming days. In the meantime, I prepared a blogpost before I left and will post it shortly. I liked the work of our Guest Bloggers and want to encourage the submission of other guest posts in the future. I would be happy to continue to post the views of market participants on the topic of the CPSIA in the future. Sadly, most television viewers don’t know what C-P-S-I-A stands for. Chances are they will press the fast forward button on their Tivo remote faster than you can say CPSC in order to skip to the latest news update on the “Octamom” story. I have come to the conclusion that the major reason this law will not be fixed to tolerable levels is because the general public takes what they hear from consumer advocates, government officials, and the media as gospel. There has been no public debate; no investigative report; no public outcry to get to the truth. Think about last Christmas season when the popular toy, Zhu Zhu Pet, was MISTAKENLY reported on every evening news program and in every major newspaper to contain unsafe levels of antimony in violation of the CPSIA. This report was released BEFORE the CPSC actually reviewed the case brought forth by the overzealous consumer advocate group, GoodGuide. Within about 24 hours after the story was released, the CPSC declared that the Zhu Zhu Pet was not in violation of any federal laws and was, in effect, safe. Do you think all the news outlets retracted their story? Did anyone offer an apology to the maker of the Zhu Zhu Pet? Do the Cleveland Cavaliers have a prayer to win a championship next year? How can misinformation regarding lead in children’s product continue to spread and be consumed by the public while the truth is buried and ignored? How can painfully obvious common sense be trumped by outlandish, unfounded claims by the non-scientific community? Consider the audience. According to a new survey released by the legal information website Findlaw.com, two-thirds of 1,000 American adults polled could not name a single current Supreme Court justice, and just one percent were able to name all nine sitting justices. I must admit, I am one of the 99% of Americans who could not name all nine without the help of Wikipedia. Now, here’s a stunner. From the 1,000 people polled, which justice was named most often? If you guessed Clarence Thomas, congratulations! If you are over the age of 40, there is a good reason you remember Clarence Thomas. The media made sure you wouldn’t forget about his confirmation hearings that took place 20 years ago. If you are under the age of forty, Google it. The same thing is happening with the media coverage of the CPSIA. The facts are overlooked and only news-worthy sound bites are publicized. The point I am trying to make is that as responsible, informed, voting Americans, we should not exercise blind faith as if our Congress always has our best interests in mind and the media is reporting the absolute truth. We owe it to ourselves to be informed citizens by doing our own research and reading a variety of media sources so that we may elect government officials into office who use common sense (and scientific facts) to make informed legislative decisions. We must get Congress and the CPSIA to realize the damage the CPSIA is causing and fix it once and for all. Please, do your research, GET THE FACTS, and spread the word! Guest Blog by Bill Chiasson, Executive Vice President, COO of ETA/Cuisenaire, a division of A. Daigger & Company. ETA/Cuisneair has over 8,000 manipulative-based educational and supplemental materials for PreKindergarten and grades K-12 that enrich teaching and engage students in math, reading/language arts, and science. Lenore Skenazy who writes the Free Range Kids Blog, has an op-ed on Forbes.com about all those CPSC recalls (previously covered on this blog here and here). "And so it goes in the unbrave new world, where nothing is safe enough. It's a world brought to us by the once sane, now danger-hallucinating Consumer Product Safety Commission." "[CPSC] actively engages in fear mongering, perhaps to give it something to do. After it rid the world of leaping lawnmowers and exploding frying pans, it turned its sights on the also-rans of corporate reprehensibility. The tricycle with a protruding screw. The stuffed animal whose button eyeball contains lead paint. And to remain relevant, it acts as if there is really no distinction between a bucking chain saw and a Little Tykes "choking hazard" the size of a salt shaker. And it just keeps getting more irrational." Read the entire op-ed: "Students Aren't Allowed to Touch Real Rocks." GUEST BLOG - Bruce Lund, Lund and Company Invention, L.L.C. on the Cadmium "Crisis"
When we put the call out for Guest Bloggers a couple of weeks ago, we received this post from toy designer and inventor Bruce Lund. While he originally posted it on his own blog several months ago, it's still relevant today. Knee jerk responses, ill considered opinions, and unsupported positions based on hearsay or questionable sources are all what led to the CPSIA legislative insanity that continues to grind on and grind up small companies with regulations that are expensive, onerous, and simply wrongheaded. Although well intentioned, the results are not those intended. On the issue of cadmium levels in children's jewelry, something which has always been in jewelry of all kinds, and has never been identified as a health risk, the Chairman of the Consumer Product Safety Commission has warned against allowing children to play with inexpensive jewelry. That, along with state level legislation may well remove jewelry for kids from the marketplace altogether - all without any science and . . . Were cadmium to be a health problem, it would have manifested itself as kidney disease, which is virtually unknown in children. The result is the toy industry and other related industries being ruled on and regulated on the basis of unsubstantiated claims in the media and politicians' knee jerk legislation, not on the basis of fact, scientific risk analysis, or sound judgment. That almost sounds like craziness to me. Where is the voice of reason? Could it even be heard over the din of today's media-saturated world? Blog post by Bruce Lund, Founder, Lund and Company Invention, L.L.C. Bruce's blog can be found here. The blog above was originally posted here on March 30, 2010. The American Apparel and Footwear Association (AAFA) Wants You! Many have pointed out to the CPSC that the additional testing costs mandated by the CPSIA have been extremely burdensome on companies and have even caused many to either shut down or abandon the children’s product market. This blog has provided concrete examples with its Casualties of the Week (for example see here, here and here). Some are still not convinced. CPSC Commissioner Adler made the point at a recent CPSC briefing that "anecdotes are not evidence." The AAFA has been collecting information ("evidence") from companies to see exactly how the testing rules have impacted their businesses. This information is important to help document to CPSC and Congress the economic impact of CPSIA. To continue gathering data, AAFA recently published two surveys online to gauge the impact of consumer product testing. One survey is for manufacturers, wholesalers and suppliers and the other is for retailers and licensors. If you are (or were) in the children's product business, we strongly urge you to fill out this survey online. It only takes a few minutes. The surveys are especially geared towards assessing the impact on businesses, and business awareness of, two proposed rulemakings that are due August 3, "Conditions and Requirements for Testing Component Parts of Consumer Products" and "Testing and Labeling Pertaining to Product Certification," as well as how the stay of testing and certification requirements impact companies’ testing protocols and costs. GUEST BLOG - The Solution to Too Many Warning Labels....More Labels! 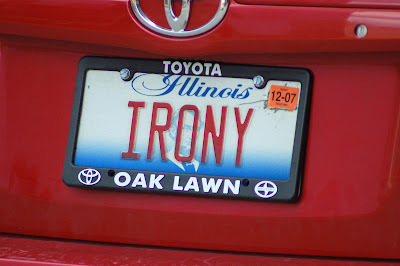 Rick has blogged several times about the new Illinois lead law (see here, here and here) and predicted that the resulting labeling requirements would result in only confusion for consumers. In one blog, Rick stated "Consumers will not ignore these labels and will treat your product as though it were poisonous or radioactive." We are letting Rick pick our Lotto numbers next week. A faithful reader of this blog brought to our attention this article from the Channel 9 News website in Denver, Colorado. The article, "Confusing warning tags on toys spark concerns for parents," (Did Rick write that headline?) reported that consumers are shocked, SHOCKED, by a tag on a small toy in a Babies R Us store that read "Warning: Contains Lead. May be harmful if eaten or chewed. May generate dust containing lead." The article goes on to quote the consumer who tipped off the station of the "dangerous" stuffed animal stating "We couldn't believe our eyes when we read the removable paper label . . . I can't imagine anyone buying this product." Is the toy toxic? Nope. The company spokesperson said "it would be too difficult for the company to maintain a separate inventory for those states." "To comply with Illinois law, these labels have been placed on the required items that are carried in our stores in all states," the Toys R Us statement read. Don't worry readers, CPSC has a solution. CPSC Spokesperson Scott Wolfson (who would be a wealthy man if he received $5 for every mention in this blog) says "even if a toy doesn't conform to California and Illinois' limits for lead, as long as a toy meets federal guidelines they are extremely safe. . . The agency is now considering adding new tags to all toys which meet federal standards, in hopes of relieving their fears." That's right. The CPSC's solution to too many warning labels? More labels! Five years ago, I joined Learning Resources eager to leverage my previous experiences for the benefit of a small business that makes a positive and lasting impact on our society. Little did I know then that this decision (one of the best in my life) would totally change my view of our government. This past week-end my wife and I visited our older son who is currently working as a summer intern for a Member of Congress. We indulged in a personal tour of the Capitol (a pretty amazing working environment if you ask me...). As we went thru the various halls of our legislative branch, we stumbled upon this quote from Louis Brandeis: "The greatest dangers to liberty lurk in insidious encroachment by men of zeal, well-meaning but without understanding". Of course, he was not thinking about our current CPSIA situation when he wrote these words in 1928. However, if the combination of good intentions with a lack of understanding is not a main source of many unintended consequences in our laws, I do not know what is. Our Constitution was built to protect us against these types of situations by encouraging all sorts of meaningful dialogue between various opposing groups, and by establishing good science as the foundation to make sound and nonpartisan decisions. Then, why after so many months - with the overwhelming market evidence, the many companies "going under", so many jobs lost, so many voices shouting for reasonable adjustments, so many questions still unanswered- why has the myriad of unintended consequences of the ill-fated CPSIA still not been addressed yet? Sadly, the answer has become all too clear. The Democratic leadership in Congress has consistently refused to have any meaningful dialogue with the various groups involved in this issue, unless they agree with their point of view. I do not need to remind the regular readers of this blog how long it took to have a proper hearing on the CPSIA! And, what has happened since then? NOTHING, absolutely nothing. Obviously, this lack of action demonstrates beyond the shadow of a doubt that the Democratic leadership in fact does not intend on making any adjustments to the law. It does not matter that the CPSIA does not make our products safer, but simply more expensive, effectively destroying an entire portion of our economy (the small/medium companies who cannot afford all these senseless compliance activities). What really matters is that the Democratic leadership and other CPSIA-supporters look like they are protecting our children in front of a camera. After all, who can argue against more safety for children products? So, while we are at it, let's have lots of recalls to make people feel that the situation is really dire and that the terrible cost of this legislation (hundreds of thousands of lost jobs) is a necessary consequence! However, the absurdity of some of the recent recalls and their numbers have reached such proportions that even consumers are now simply tuning out. Did you not hear growing up that one should not cry "Wolf!" too many times, or risk finding oneself without support when it is really needed? This fast evolving situation is the direct result of the political decision from leading Democrats (Waxman & Co.) to strip the CPSC from any true independence. The Commission has stopped using sound judgment and making decisions strictly based on sound science. By playing along with a populist political agenda, the CPSC leadership is responsible for creating a situation that is out-of-hand. The separation of power between the legislative and executive branches was created for a reason! So what does this means for me? As the president of our company, I have had to eliminate jobs, terminate projects, stop investments in our future growth, and reduce the number of new products we develop each year. Why? Simply to pay for all the incremental and constantly increasing costs of complying with the CPSIA. With new revisions constantly being added to the law and some retail customers “pouring oil on fire,” we may not be done cutting our workforce and stopping investing in the future! Our products help children engage and develop an early passion for math or science. I think we can all agree that these are the kinds of children's products we need right now. Over the last 25 years we have built one of the most prolific innovation engines in the education market. So, the real "losers", thanks to the CPSIA and the Democratic leadership, will be our children and with them the future of our society! Did I mention that all these incremental costly requirements will result in absolutely ZERO incremental benefits in terms of safety for our children? Surely you have seen the compelling and comprehensive set of data that Rick has documented so diligently over the last 18 months in this blog. Did I also mention that for more than 25 years our safety record has been impeccable? This situation is absolutely maddening. I have now learned a civic lesson that I will not forget for a very long time. I want these "well intended " leaders out the door! I owe it to my co-workers, the teachers that we serve, and to the children that need our products. I can accept a misguided law, but I cannot accept continued intolerance and ignorance from our leaders. Being on the frontline of this battle, as the president of a small business, has opened my eyes and I am better off from it. Our country needs jobs, lots of them right now, and it is the small businesses - that this wrongheaded Congressional leadership is working so hard at destroying - that can provide them. Do not close your eyes. Speak up against this CPSIA absurdity and those responsible for its awful implementation! I was not sure what all to tell. Narrowing down the story to a blog, or even a short conversation has been a challenge. Do I mention that we are not "unintended consequences" but rather, "collateral damage"? Do I bring up the seniors I help who are so old they do chair Tia-chi, who can afford lunch only when they can make it to the senior center, but have made wooden trucks for 40 years? Do I bring up the fact that with NO notice to this cottage industry we are forced in the middle of the supply chain to test our products because large toy companies were breaking an already existing law? Too much...too much to tell, so this is what I wrote. Just my story. In November 2008 I learned about the CPSIA. I thought that was the beginning of my journey with this law, but I realize now that my journey began when I was seven years old and participating in my first craft show with my mom. I was selling anything I could make, mostly small animals I had made from pom-poms, felt, glue and little googley eyes. Before age 12, I added to my "line" a small army of "pet rocks," cats cradle kits, quilt patches, purses, and many, many other kids' crafts. When planning my family, I decided to start a business that would allow me to stay at home with my children. I started with what I knew, crafty-ness, sewing skills and some of my favorite memories of my childhood, reinvented. One thing lead to another, and before my daughter was a year old I had a business that would eventually help us buy a house in San Francisco. Time passed, my business grew and so did my family. It was amazing being there to watch both of my daughters take their VERY first steps on their own, to be the one they turned to when they got hurt, to be their mother. I loved being there, and I knew I would not be in that situation without the money from my little on-line business. We sold our house in San Francisco and moved to Portland, Oregon in March 2008. At the time, my business was strong. My line was growing and investing in my business seemed like the right move. My husband agreed and we invested a large portion of the profits from selling our house into my business. I bought supplies and began production. When I bought the supplies, what I was making was legal to sell, but in August 2008, unbeknownst to me at the time, my life was taking a U-turn. Then I got the email: "if you make ANY products for kids, this law [CPSIA] affects you!" I have to admit I ignored the first 20 or so emails, because I could not believe that my little sew-in-my-basement business was being forced into the same regulations as Mattel without any warning. As the days went on, and the number of emails I received grew, I realized my dream was crashing around me. I called the lab, got the quote and did the math. CPSIA-mandated testing costs for my little product line was over $27,000 for just over $30,000 worth of product. I cannot express the horrible feeling I had when I realized that I had made a mistake that was going to cost my family all of our money. In the business world, companies recover. In my case, I WAS the company and what family can recover from a loss that huge? I was not only losing my investment, but I was also losing my source of income. With the February 10, 2009 deadline to comply with the new lead standard only weeks away, the panic took over and I was fighting with everything I had to reach someone who would help make this nightmare go away. I found a group of people nearby who were renting an XRF scanner, and I rented it for 24 hours. I tested every single item, every color way, every button style, every fabric piece, every color and style of trim...I tested in my tiny basement, next to my washer and dryer, for 15 hours. I was driven by a fear that I cannot describe. I needed to know that when I called every person in DC that I could think of, I could be certain that I had a product that was safe in March 2008 and continued to be safe, even though I did not have $27,000 to test my products to prove it. I would wake up at 5am Portland time, to begin calling everyone imaginable in Washington, DC -- any number I could find. I had never been politically active before and had NO IDEA how things worked. I genuinely believed that some Congressman would take my call and realize that a mistake had been made. I would start to tell my story, pacing between my washing machine and computer, crying to these aids who would reply "Thank you for your call. I will pass your message on." I could just feel the rolling of their eyes and bored posture as I was begging them to let me talk to someone who could help me. By 8 am, when my girls were up, I would be so emotionally drained and my spirit was crushed. I did this for weeks and it was truly one of the most painful times of my life. The days passed, the fight went on. I would ask these aides and CPSC staffers "what do I do? Should I just throw it all away?" and their response would be "I cannot tell you what to do." I was begging for help and they would only give me "I cannot tell you what to do.". any safer? No, instead there will be no products. I have invested thousands of hours in trying to get the CPSIA changed to allow crafters - young and old - to continue their craft. The time I spent trying to bring common sense to the CPSIA was time I was not investing in my business. I was afraid to let up the fight because I was not seeing anyone else fighting for ME. Where was my Senator, who told the crowd "folks, we did this for safety"? Where was the ombudsman to help guide the way at the CPSC? (Surprise! There STILL is not a position at the CPSC to help the crafters, the stay-at-home moms who use skill and time to help feed their kids). Where were the Congressmen who represent me and the seniors who have made SAFE children's products for 50 years, and who can barely afford lunch and would NEVER be able to afford testing? Who is looking out for the children who will learn from their mothers how to nurture their entrepreneurial spirit? Last July I hit bottom. I had to turn my children over to daycare workers and join the work force just to keep us in our tiny rented house. My little business that helped us buy a home, that kept me at home with my kids to help them learn and grow, was no longer a safe investment of my time. This is happening all across the county; women just like me, who are making safe kids' products, are being forced to end their stay-at-home businesses. Mothers who want to obey the law, who are afraid of the consequences of NOT obeying the law, are making the choice to give up their dream to keep their children warm and fed. We need a law that does not make us criminals. We MUST have a law that does not criminalize the old, young, and poor because they make safe products that they cannot afford to test. On the second day of after-school care, I went to pick up my 5 year old daughter from school and the "teacher" pulled us aside as we were leaving. She said, "Jane had a tough day today, she did not want to be here. She wanted to be with her mom." The "teacher" continued, "I am a grandmother and I know how to deal with this, so I took her by the hand and walked her to the mirror and said, 'Jane, look at your face. Look at how UGLY you look when you cry.'" I blame every one of the Energy and Commerce legislative staffers for the emotional injury to my daughter that day. She should be home with me, being raised by a mother who believes in the American spirit of hard work, integrity, and honesty. She should be home with me while I continue my business of making safe children's products. She should be home with me, making pet rocks (illegal to sell today) and having fun making pom-pom animals with her mother – like the ones we used to sell at the local Saturday market. My daughter is the CPSIA casualty of the week. Okay conspiracy theorists. Do you think the Capitol Hill newspaper Politico held this story until Rick was out of town? In a front page story today “Dangers on the Hill” Politico reported that Congress’ Office of Compliance have found an estimated 6,300 safety hazards that are “potentially fatal or could leave victims with serious injuries." That’s right, Congress is dangerous to your health. We couldn't make this stuff up. To read the entire article for yourself, click here. (warning it’s about 1800 words). IF YOU’RE the parent of a young child and want to be very scared, don’t waste time looking for horror movies on TV. Just go to the US Consumer Product Safety Commission’s website for child product recalls. You won’t be able to sleep for days. The site features an interminable selection of common children’s products that have been recalled. Some of the depictions are downright gruesome: in cases of defective cribs, for example, there are pictures of baby dolls with necks pinned down between rails, or of their little faces pressed against a mattress, as if suffocating. The intent is, to be sure — for I see no other reason to scare the wits out of an unsuspecting, Internet-roaming mother — to jolt parents into action if they own one of the products. One recent afternoon, I was clicking through the recalls page when I realized, to my dismay, that during my 9-year stint as a parent I have owned several of the featured items. My colorful rainforest-themed baby swing was there, and so was one of my cribs. The baby sling I used with my son was recalled after three babies suffocated in 2009. The kinds of bath seats I used (and loved) with my daughter aren’t sold anymore, following various recalls. I never found out about these announcements. Had I taken the time to register each product I might have heard from the manufacturers, but I didn’t do it, and neither do most of the parents I know. Some pediatricians’ offices and stores post selected recall sheets, and there is an e-mail list from Consumer Product Safety Commission one can opt into, but with over 100 of these announcements per year it’s hard to keep track of the information. Part of the problem is that recall announcements don’t explicitly distinguish between problems with products that are truly dangerous and defective versus products with sub-optimal design that, when used properly, pose little risk. For example, the commission recently recalled a bed because one child got his head stuck in its storage compartment. Not to take away from that kid’s pain, but I have numerous compartments in my home where my children’s heads would fit if they tried hard enough. In a way, some of the announcements appear to be directed at shielding us from our own parental incompetence. Millions of baby bath seats and walkers are no longer sold due to drownings and falls suffered by babies who were basically left unsupervised. The recent high-profile recalls of drop-side cribs were prompted by deaths that, in some cases, were caused by cribs that were incorrectly put together or were subjected to shoddy home repairs. Don’t get me wrong: to the extent that these recalls remove poorly designed products from the market the efforts should be praised. If motels and hotels are forced to carry safer cribs, that’s a good thing. But the Consumer Product Safety Commission and other safety advocacy groups should be mindful of putting each recall into perspective, so as not to unnecessarily scare the public. For example, the multiple recalls (and likely national ban) on drop-side cribs comes after 32 documented deaths over the last 10 years and millions of cribs sold. That’s surely 32 deaths too many, but more children die each year choking on food. There is a real downside to a system that feeds into our nation’s growing safety paranoia, which isn’t healthy either. Many of my overseas friends have a hard time understanding our obsession with safety — we put locks on our toilet seats, cover the corners of tables with rubber guards, and use hand sanitizer with ever-intensifying zeal. Taking that baby walker away, just like covering the table corners, is a bit like avoiding air travel for fear of crashing, while still driving a car every day. The world is a very dangerous place to raise a child. Leave the house and there are hard edges, pointy rocks, and steep inclines everywhere. As much as we’d like to, we just can’t childproof those too. Sylvia Pagán Westphal is a regular contributor to the Globe opinion pages. Labels: Consumer Groups, Corporate Casualties, CPSC Leadership, Guest Blogs, Mass Market Companies, News Reports, Recalls, The Marketplace, Who Can You Trust? I am going on vacation (!) and therefore my blog will be dark, more or less, for a couple weeks. In my absence, we have invited a few friends and interested parties to contribute essays on the CPSIA for inclusion in this space. We do not plan to edit the posts, and hope you will enjoy them. If you have something to say and were not solicited by me, feel free to send me your essay(s). No promises, but we will consider anything you send us. We are open to opposing views as well. It is my hope to stimulate debate and discussion of important issues relating to the CPSIA . . . before it's too late. CPSIA - Lead Isn't the ONLY Danger Out There . . . . The Onion News Network broke a controversial story today about yet another danger caused by modern society. And you thought state regulation of children's products was a fait accompli, nothing we can do about it. The proliferation of state safety regulations is a major hindrance to interstate commerce and puts small and medium-sized businesses in a very risky position. Who can possibly master the federal system of safety laws and regulations plus 38 states' own unique versions (plus the EU, plus Canada, plus Japan, plus . . . plus . . . plus)? No one. The CPSIA addressed this mess by ENCOURAGING IT. The law does not preempt a variety of state laws relating to the safety of children's products. Among the notable laws so exempted, California's Proposition 65 is especially troubling. That said, I cannot recall a single word of a single state children's product safety law that has been preempted by the federal government. It's the Wild West out there. Worse yet, this subject is among the many that are "off limits". In other words, we are advised to keep our opinions on preemption to ourselves for risk of "offending" the controlling Democratic party. The non-preemption of state laws that conflict with the CPSIA, CPSA and policy and regulations of the CPSC are to be tolerated, I guess. We have no say in this. Like so many things nowadays . . . .
Aha, but when the liberals don't like the action of the states, well then preemption is apparently a viable option. So today the federal government decided to take action against the Arizona immigration law. [I am a minority and am generally fearful of government rules that encroach on protections for minorities. Of course, like most of the media and America at large, I haven't read the Arizona law. So while I am directionally in favor of knocking it out, I freely admit I don't know much about this controversy other than the things I have gleaned from other people's analysis.] So I guess preemption is a viable option . . . if the motivation is there. The federal complaint makes many compelling assertions about the value and importance of preemption in the case of immigration law . . . and many of these assertions could just as easily be levied against state regulation of children's products. It will never happen, of course, because that might offend the "public interest groups" behind the CPSIA. Besides, who can trust companies anyhow . . . .
"In our constitutional system, the federal government has preeminent authority to regulate immigration matters. This authority derives from the United States Constitution and numerous acts of Congress. . . . The Constitution and the federal immigration laws do not permit the development of a patchwork of state and local immigration policies throughout the country." "The federal government, moreover, welcomes cooperative efforts by states and localities to aid in the enforcement of the nation’s immigration laws. But the United States Constitution forbids Arizona from supplanting the federal government’s immigration regime with its own state-specific immigration policy – a policy that, in purpose and effect, interferes with the numerous interests the federal government must balance when enforcing and administering the immigration laws and disrupts the balance actually established by the federal government." "In crafting federal immigration law and policy, Congress has necessarily taken into account multiple and often competing national interests. . . . The laws also take into account other uniquely national interests, including facilitating trade and commerce . . . ."
"Because S.B. 1070, in both its singularly stated purpose and necessary operation, conflicts with the federal government’s balance of competing objectives in the enforcement of the federal immigration laws, its passage already has had foreign policy implications for U.S. diplomatic relations with other countries, including Mexico and many others. S.B. 1070 has also had foreign policy implications concerning specific national interests regarding national security, drug enforcement, tourism, trade, and a variety of other issues. . . . Numerous other states are contemplating passing legislation similar to S.B. 1070." The Feds have noted that the patchwork of local laws would likely prove highly disruptive to efforts to coordinate a national policy on this topic. They are apparently fearful that the Arizona law will lead to many more just like it in other states. Among other reasons to fear the new immigration laws, local laws can have international implications and can hurt trade. I think I know what they are getting at . . . . Consider the market effects of the noxious Proposition 65 and the truly awful and frightening Green Chemistry initiative oozing forth from California in our direction. The case for this preemption lawsuit is eerily similar to the case for preemption of local safety laws. Unfortunately, we will never get this help unless the Feds decide that the system is so out-of-whack that a lawsuit must be filed. With Dems in charge of Congress who are the blood brothers of consumer groups, this will NEVER happen. Too bad for us. I feel the federal government's pain on the Arizona law. Too bad they don't feel mine. USA Today, July 3, 2010 "Pool-safety advocates decry loss of drain backup rule"
Yes, the safety enforcement circus carries on. The USA Today reports that AT LEAST 70 people have died in pool drownings since Memorial Day (May 31). The July 3 article appears 33 days after Memorial Day, so that's more than TWO DEATHS A DAY. Another 80 almost drowned - the total serious injuries and deaths is about FIVE A DAY. And the CPSC's reaction - if the deaths didn't occur from pool drains, we can all breathe a sigh of relief. WHEW! If they had died from a pool drain, that would have been really TERRIBLE. Of course, the victims are still dead. Not a safety concern, apparently. We must stay focused on pool drains . . . .
And why did Ms. Wasserman Schultz think this action was so "egregious"? Here are her words: "We understand that the interpretation that CPSC adopted is the same one that the pool and spa industry endorsed, and is not the interpretation that public interest groups and victims' families had urged the Commission to adopt." Aha - how DARE the CPSC defy consumer groups in favor of evil industry?! Doesn't the agency know that if industry wants something, it must be bad for consumers?! Democratic Senators pitched in as well they could. Drawn from the same rogue's gallery that brought you the noxious CPSIA (Pryor, Durbin, Klobuchar, Nelson (FL) and Dodd), the Senators stated that the Commission violated "both the spirit and the letter of the act." Okay, Junior Scientists of Congress, committed to making us so so SOOOO safe, please note that deaths from pool drains totalled 11 in ten years according to the CPSC. However, total deaths from pools is more than two a day since Memorial Day, and has averaged 385 per year for children under 15 in recent years. So you guys are hassling the agency over a design flaw that causes 11 deaths a decade, and seemingly want it to be the priority of the agency over, say, general pool deaths which total almost 4,000 kids each decade (about 3,000 are under five). Perhaps you should have sent your letters to the families of the 70 victims in the last 33 days so they'd know how much you care. For a change (it's been a long-g-g-g-g time coming), the agency was trying to make a practical decision on how to implement a very expensive law focusing on a small problem. The data now suggests that the expense of the Virginia Graeme Baker repairs are prohibitively high, especially in light of the infrequent injuries (however horrific). Sadly, when it could finally take the high road, the agency flinched in front of the press, insulting the memory of the 70 recent drowning victims. To slough off the 70 recent deaths because they weren't caused by pool drains is nothing short of abdication of duty (or resignation to failure). I don't know about you, but I am plenty tired of politically-motivated, pet project, holier-than-thou safety. This benefits no one other than the pandering politicians hoping to dupe you into voting for their reelection. Will this madness EVER end??? Consumers Union (June 16, 2010): "While [the CPSIA] has made great strides in improving product safety, and will continue to do so as its implementation continues, the CPSIA focuses on improving safety by requiring that children’s products subject to mandatory standards be tested to ensure compliance with the standard. The law does not address bringing foreign manufacturers into our civil justice system. However, to fully protect consumers from unsafe products, wherever they are made, American consumers must be able to hold manufacturers accountable when they are harmed – no matter where the products are made." Consumers Union goes on to assert: "If a foreign manufacturer knows that they cannot be held responsible in U.S. courts for the products they sell, this knowledge has a likely significant impact upon their manufacturing decisions. Do they use the stronger, more expensive component? Do they ensure that the product meets the safety standards? Do they prioritize safety if they know they are not accountable to U.S. consumers in U.S. courts? Holding manufacturing entities accountable in our civil justice system acts as an important deterrent to unethical and potentially harmful business conduct." "In addition, even if a victim successfully serves process on a foreign manufacturer, the manufacturer will likely challenge the exercise of personal jurisdiction over it by a U.S. court. Under well-established constitutional due process principles, before a U.S. court can exercise personal jurisdiction over a defendant it must consider: (1) the defendant’s purposeful minimum contacts with the state in which the court sits, and (2) fairness to the defendant of being subjected to jurisdiction in that state’s courts. . . . H.R. 4678 requires foreign manufacturers and producers that import products into the United States to designate a registered agent who is authorized to accept service of process here in the United States. . . . Registering an agent consistent with the Act constitutes acceptance by the manufacturer of personal jurisdiction of the state and federal courts of the state in which the agent is located." Problem solved! Congress found a way to circumvent the framers' intent. That darned Constitution gets in the way of good government, you know. Opponents to the bill made arguments similar to those previously highlighted in this space (see above and here): American Association of Importers and Exporters and National Customs Brokers & Forwarders Association of America. I estimate that our business will lose 25-50% of our foreign suppliers and untold numbers of component factories if they are required to have a registered agent under this new law. Most of these sources are irreplaceable in our business (for a variety of reasons). That means that the products we make at these factories will have to be discontinued. Too bad for us, I guess. This could happen quickly, too. I wish that were the only problem. The lame-brained notion that foreign countries will allow U.S. citizens to cross borders to take domestic assets to settle foreign disputes will prove to be delustional. U.S. companies will soon be greeted by reciprocal registration requirements or even harsher laws exposing them to onerous trade barriers and significant new legal risks. Again, our business is squarely in the bullseye of this maelstrom. We have worked tirelessly for more than 20 years to build an international network of dealers for our products. That creates JOBS here. Anyhow, it is inevitable that a law like this will spawn a need to register our company in dozens of countries abroad, meaning we would need to hire a law firm for each country, translate all the laws, decide if we want to bear the expense and risk of registration. Our foreign business would evaporate quickly and efficiently. The basic idea that our country actually needs this law is hard to comprehend. Where are all the hungry plaintiffs' attorneys who can't put food on the table? Which rights aren't being satisfied? For each product imported into this country, there must a U.S. importer. Why isn't that pool of assets enough to satisfy this need, as it has been for years and years? Why doesn't importers' exposure under the U.S. tort system provide enough incentive to address Consumers Union's parade of horribles above? I thought that's why we have our crazy tort system in the first place. No answer has been provided by Congress to these questions. They just gave us a wonderful new law to worry about. Thanks so much, Democrats in Congress. We love ya! And we can't wait to vote AGAINST you! See you at the polls. 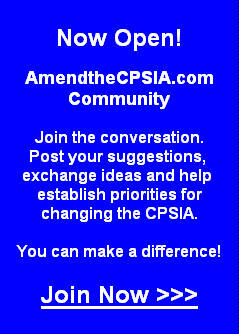 CPSIA - It's Election Season - What are You Doing About it? We have suffered through two years of savage persecution by an unmoved federal government seemingly bent on our destruction. Now this Democratic Congress is coming up for reelection. What are you going to do??? In my case, I am committed to put my money where my mouth is. I am not content with mere grumbling in a blog - I am getting involved in several races and intend to raise money for candidates who will support a sharp revision of the CPSIA and rein in the expansion of our lardy and intrusive federal government. The goal is to take away the House Energy and Commerce Committee gavel from the bullying and anti-business Henry Waxman. He has proven time and again that he and his staff don't care about our problems nor are they interested in understanding how our problems will become everyone's problems in due course. In casting our industry overboard for a misguided legislative scheme designed by consumer groups, he picked sides. Now we get to pick sides ourselves. Last week, we were pleased to host Joel Pollak, Republican candidate in Illinois' 9th Congressional district (www.pollakforcongress.com) at our company. We had a spirited Q&A session that left everyone impressed with Joel's intellect and integrity. Joel is a breath of fresh air, especially in the 9th district, lately represented by Jan Schakowsky, Vice Chair of the Subcommittee on Commerce, Trade and Consumer Protection. Ms. Schakowsky is one of the staunchest defenders of the CPSIA and through her actions, has declared herself an enemy of your companies and everything you do. We support Mr. Pollak in his effort to unseat her. More to the point, we are going to do everything in our power to help Mr. Pollak bring his issues to his constituents and put Ms. Schakowsky to the test. You can do this, too. In your local district or statewide election, your energy and sense of purpose can be a difference-maker. Host a coffee, volunteer some time, ask the candidate to make an appearance. If you are able to raise funds for the campaign, all the better. If you are not happy with the direction of your country or your government, exercise your Constitutional rights and get involved. We will never take the gavel away from Henry Waxman through worry, frustration or prayer. We are only going to help ourselves by working hard for candidates who understand our issues and will stand up for the free enterprise system. There is a lot at stake here - the future of your company, the jobs you provide your valued associates, the economic well-being of your customers and suppliers and their employees, not to mention the kids, the families and the schools who depend on your products and use them safely every day. All of those people are counting on you to defend them. Don't sit still - it's time to act. The election is only about four months away. Election day could be a real triumph after years of dire straits and frustrations. There's still time to fix the CPSC and this law - but we all must do our part. A new Congress is a good place to start. I hope you will use this space with suggestions on how we can all help our chosen candidates. I will publish the best ideas in future blogposts as well as comments to individual blogs. CPSIA - What?! Too Many Recalls - That CAN'T Be! The Washington Post stated the obvious this week in an article Friday entitled "Officials Worry about Consumers Lost Among the Recalls". Apparently, the surge in recalls has caused consumers to increasingly ignore them. Apparently, many consumers choose to continue to use recalled items or even to eat recalled food. Among the issues, the swelling number of recalls encourages consumers to assume that they are not serious. In addition, the onslaught of recalls is numbing to consumers. Prominent recalls that appear to be based on junk science or Regulatory Multiple Personality Disorder (RMPD), like my personal favorite McDonald's Shrek glasses which were recalled despite the CPSC's admissin that they were perfectly safe, only amplifiwa the sense of a system is out of control. Among the useless advice offered in the article is the recommendation that all merchants should do as Costco does, which is to call every customer who has ever bought a recalled item in its stores. What Costco does is admirable, but it is entirely dependent on being a multi-billion dollar, high tech mass market retailer. I think it would be great if I could hit my nine iron 205 yards like Tiger Woods, but then again, it ain't happenin'. It's about as realistic to advise (or require) me to match Mr. Woods distance and accuracy with his golf clubs as it is to require all U.S. merchants to match the achievements of ONE of them, namely Costco in this case. Unfortunately, the article's suggestion is utterly out of touch with reality. Bad news - the world's imperfect. . . .
Whatever we do, we certainly shouldn't address the standards for how recalls are determined, staged or publicized. We may disagree about many things, but we all have to acknowledge that our government COULDN'T be at fault. Certainly not, their every choice and execution is perfection by definition. It's obviously the fault of industry. Editor's Note: In case you were wondering, I was being sarcastic in the paragraph above. The Post article also clucks about the implementation of registration cards for durable infant products like cribs and bassinets. I have consistently pointed out that durable infant products are in a different category because they are useful for a long time (hence the word "durable") and tend to be handed down from one generation to another, often being used over decades. On this basis, having a way to reach consumers is a good idea. BUT we need to acknowledge an important consequence of this idealistic solution - the new rules tend to make it very difficult or even illegal as a practical matter to START a business catering to these markets. For those companies crazy enough to remain in the durable infant products market, the new rules on registration cards and data retention is a Gift from Above. The infrastructure and overhead burden of this requirement will be unbearable for any except the most well-capitalized companies. I am glad I don't need a crib now. Considering how many companies have been crushed by recalls, the penal attitude of the agency (with huge penalties possible LONG after recalls are announced), tough new standards and regulations on the product class, and the new registration cards, I cannot imagine many companies remaining in this market for much longer. The ensuing lack of competition will likely mean fewer products, much higher prices, less innovation, fewer available imports. The CPSIA is a protectionist regime for those few companies not already bankrupt at the hands of the government. I am not in this business and my kids are older - for once, this is someone else's problem. I think the government's approach to fixing this problem is completely wrong. They seem to be taking their instructions from a very small and insular group of consumer advocates whose judgment on these matters is largely unchallenged by industry or an inquisitive media. [Media is only inquisitive these days if they can portray a crisis, it seems to me.] Having bought into these harsh concepts at the hands of consumer groups, the government today is busy patting itself on the back for a job well-done. We'll see . . . . In the meantime, with the CPSC announcing micro-recalls like Daiso's latest (190 pieces recalled - total, including inventory on the shelf - of five items selling for $1.50 at retail), the consumer is left wondering if anything is safe or everything is safe (and the government has lost its mind). I can't tell you but my guess is closer to the latter. And the Washington Post says you are all checking out. Good job, regulators! Labels: Cadmium, Consumer Groups, Corporate Casualties, CPSC Leadership, Lead, Mass Market Companies, News Reports, Recalls, Small Business, The Marketplace, Who Can You Trust? As the CPSC announced when it kicked off Pool Safety Week in late May, deaths and injuries to children from pools and spas are breathtaking in scale. CPSC statistics indicate that deaths from pools and spas average more than ONE PER DAY and serious injuries requiring emergency room treatment average more than 11.5 PER DAY. Now THAT'S a serious problem. By contrast, lead accounted for one death and three unverified injuries over eleven years. So in one day, pools injure more kids than lead did in eleven years. And how does the CPSC respond to these two threats? Well, for lead, they force industry to spend more than $5.6 billion per year in compliance costs (this doesn't even count aggravation costs). Love that sense of balance and proportionality. Of course, whacking innocent companies over lead gets good headlines and makes the regulators look valiant. No one wants the agency to crack down on pools. Perhaps it's only cynics like me that think this lame approach reveals a lack of commitment to safety by both the agency and Congress. Perhaps our regulators think Public Service Announcements are PERFECT to reduce the scourge of pool deaths and injuries, but only asphyxiation of the children's product industry will address the lead "threat". Particularly amusing, then, is the response of municipalities to the Pool Safety Initiative. Who remembers Chairman Inez Tenenbaum's hearty self-congratulation on February 17, 2010 for conducting inspections of 1200 pools? Her words: "We've carried out my principle of firm but fair enforcement of product safety laws by inspecting 1200 public pools and spas for compliance with the Virginia Graeme Baker Pool and Spa Safety Act - the results gave us good reason to believe that the law is working". She made a similar assertion in Congressional testimony in September 2009: "In addition, CPSC investigators have inspected over 1200 pools and spas in 38 states as part of a recently launched enforcement initiative. The good news is that CPSC’s public outreach and education efforts seem to be having a positive impact in this area. Recent inspections show that most public pools and spas have installed or have plans to install the new, compliant drains covers and safety equipment in the near future. Let me state again, contrary to some reports, there are many more public pools and spas that have been made safer because of this important law." Problem solved? According to the Fresno Bee, it's hardly a closed book: "About half of the 1,300 public pools and hot tubs in Fresno County do not comply with new state safety standards designed to prevent swimmers from being caught by suction on drains, county officials say." [This is the Virginia Graeme Baker law.] What explains the hold-up? The repairs are costly and then there's the sense of urgency: "Mary Jo Quintero, water safety program coordinator for Children's Hospital Central California, said she is not aware of any entrapment injuries occurring in the Merced-to-Bakersfield region during her 30-year tenure at the hospital." Perhaps you have heard of the financial problems in California and in municipalities in general. Think of the impact of this law when money is in short supply: "The city of Fresno retrofitted its four large pools more than a year ago, costing about $60,000, said city spokeswoman Heather Heinks. 'We are totally compliant. It's been county-inspected,' she said." So a few public pools have been fixed . . . and as for the rest of the public pools - no one is in much of a hurry. "Although many pools are not yet up to code, officials say they have no plans to immediately shut them down." So the local government is blowing this off. What about private owners? Are they just as bold, or are they afraid to defy government agencies armed with heavy penalties? "However, some apartment owners are closing pools on their own because they can't afford the upgrades, said Bob Waterston, a former Fresno County supervisor who owns a pool company that specializes in the retrofits." The CPSC is running Public Service Announcements telling you to watch your kid in the pool (duh) in response to a childhood activity that is wildly popular and scandalously dangerous. The agency is also bragging about its enforcement of this high-profile law, asserting results that seem to be untrue. Hmmm. And as for the lead "problem" that produced one death and three unverified injuries in more than a decade, the CPSC has been actively developing rules that will lead to business death by compliance. I just love our government! CPSIA - What Will CPSC Hit Daiso With This Time - Nukes? Dastardly Daiso, the hapless Japanese chain of dollar stores that probably regrets the day it first heard of the U.S., has been forced to recall yet more items. This recall, their sixth in recent years, involves five items for excessive lead. They are currently under injunction by the CPSC and the U.S. Attorney. Uh-oh. Excessive lead in kids' products - that sounds AWFUL, doesn't it? In the tradition of most modern commentators, I thought I'd write this blogpost without reading the recall notice. After all, I know what it says without reading it, right? Well, at THIS blog, we have standards, you know. My editor INSISTED that I read it. So I read it, and here are the details. You better sit down . . . the horror of it all . . . there are five items involved: one cloth purse, two pairs of earrings and two necklaces. The total number of units, across all five items, is 190 pieces, or less than 40 per item. And how did dastardly Daiso endanger kids THIS time? "The surface paint on the zippers of the coin purses and the clasps on the jewelry contain high levels of lead." Whoa! The retail price of these items is about $1.50 each, so the total value of this recall is $285. There were no injuries reported. The CPSC put out a press release so all of America could know how safe they were. SCIENCE TIME: The presence of lead in the zipper paint and in the clasp does not itself cause any harm. Lead is a neurotoxin, true, but lead must enter your bloodstream to do harm. And if it does manage to get in there (through inhalation of dust or through ingestion of bio-available lead), blood lead levels must rise to a certain point before any harm can possibly occur. Since we all consume lead every day in our food, water and air, the human body clearly can process some lead without harm - it does not simply accumulate. The amount (mass) of lead in these items is probably close to nil. I assert that if you chose to have a meal comprised of only the zippers and clasps from the 190 recalled units (ALL of them), you could not raise your blood lead levels high enough to do damage. AND the impact of lead in blood varies by the age of child. As the child ages, the impact from lead dramatically diminished. This is why Congress chose not to protect my blog readers - they are all adults and out of harm's way. Lead is principally a problem for the "under 3's". The Daiso items are not for children under three, so the odds of harm are excruciating low. And it is utterly inconceivable that one person would eat all of the zipper paint and clasps in this minuscule recall. So, is this a public health crisis? You decide! Back to Blog Time: Now, let's think of Daiso and its sorry tale. They have previously been the subject of five recalls of 19 items, totally 698 units, over two years. For this series of "transgressions", they were whacked with an injunction by the U.S. Attorney against further importing of toys (Tenenbaum: "Now the fine was large, but that wasn’t the big news . . . . We worked closely with the Justice Department on this case, and Daiso has a very high hurdle to jump over to EVER get back in the import business again"). Daiso also was hit with a "get the message" penalty of $2.05 million. This is about $1,000 per unit in penalties for items with a retail value of between $1 and $4 each. That's gotta get your attention. So now that Daiso has stepped across the line again, what will the CPSC do? This kind of transgression can't go unpunished, right? Don't we live in a society based on retribution today? [We learned it from the Taliban.] Having hit Daiso with a $2.05 million penalty last time, the agency has to set this penalty higher since Daiso obviously is so incorrigible. If the last penalty was $1,000 per unit, maybe the agency should hit them with a penalty of $100,000 per unit to get them to take our laws seriously. Darnit, they CAN'T - that exceeds the maximum penalty of $15 million. Now what? There's always jail time. Somebody needs to pay, of course. How can the agency ignore an offense of this scale? 190 units is unforgivable. That's almost $300 in value! That's like one iPhone (with a two-year phone contract). We can't let the people be endangered like that! They were really good at torture in the Middle Ages - maybe something gory would get Daiso's attention this time. Capture a manager and have him/her drawn-and-quartered in the public square? The agency could webcast it! There are so many options. The agency needs to do whatever is necessary to keep American kids safe, so I certainly hope they will use their entire arsenal. Waterboarding? Personally, I am grateful to Congress for not giving the CPSC nukes.